No matter what school you end up at, a college education costs money. And, if you’re not aware of the resources available to you, you may think that a college education is difficult to afford. While we can’t tell you where you should go to college or what you should study, we can to help you overcome some of the financial hurdles you may encounter on your college journey. The good new for Washington D.C. residents is that the District of Columbia and neighboring states provide many grant and scholarship programs designed specifically for you, and you don’t have to be a genius or demonstrate financial need to qualify for all of them, either. In fact, DC was awarded a federal Race to the Top grant for being an area that is leading the way in education reform. That’s good news for you because DC has been using those funds to increase education quality and financial aid supply. Additionally, DC’s Tuition Assistance Grant (DCTAG) awards eligible DC residents with grants that fund the difference between in-state and out-of-state tuition at multiple public colleges throughout the country. How can you take advantage of these opportunities? Let’s take a look at the steps every Washington D.C. student should take to fund a college education. All US citizens can start their financial aid journey by filling out the FAFSA, which stands for the Free Application for Federal Student Aid. We can admit that this is one of the less exciting, and sometimes painful, parts of the financial aid process. However, it should pay off by the time you’re done. The FAFSA is a necessary component for most scholarship and grant applications, and the form itself determines your eligibility for several types of financial aid. It is common to experience frustration with the FAFSA, so don’t hesitate to seek out help! If you have questions along the way, check out the handy guide we’ve created about the process. Make sure to fill out the FAFSA as soon as possible in order to qualify for scholarships and grants that have application deadlines. Wait a minute, the District of Columbia isn’t exactly a state, is it? Technically, no. But, in terms of financial aid resources, DC’s Office of Higher Education Financial Services (HEFS) has you covered. HEFS provides its own listings of grants and scholarships specific to residents of your district. Neighboring states have extended some financial aid services to DC residents, as well. Important: Be sure to apply to these after submitting the FAFSA in order to qualify for additional aid. DC Tuition Assistance Grant (DCTAG) for students whose family’s taxable income does not exceed $1 million, and who are enrolled at public colleges throughout the US, Guam, and Puerto Rico. The Grant provides up to $10,000 towards the difference between in-state and out-of-state-tuition, as well as providing up to $2,500 per year toward tuition at Historically Black Colleges and Universities (HBCUs) across the nation, and private colleges in the Washington D.C. Metropolitan area. You may apply for this grant starting in February. The application period generally closes in June. DC Adoption Scholarship Program (DCAS) for adopted students who lost their parents in the terrorist attack on September 11, 2001, in Washington D.C. The program offer grants and other awards ranging from $10,000 to $50,000 a year, to be used for a maximum of six years. Mayor’s Scholars Undergraduate Program for students living in the district who demonstrate financial need and who intend to attend an eligible college or university in the greater Washington area. The award funds up to $4,000 per academic year, for a maximum of four years for students pursing an associate’s degree, and a maximum of six years for students pursing a bachelor’s degree. Dwight P. Jacobus Scholarships provides a $1,000 award to ten residents of Maryland and the District of Columbia who are pursuing a career in business education at an eligible institution. In addition to governmental funding, nonprofit organizations such as the DC College Access Program (DC-CAP) have several grant and scholarship programs that you can apply for. The DC-CAP is a nonprofit organization that works directly with nonprofit and charter schools in DC to provide counseling and financial assistance to DC students who might not otherwise have the opportunity to attend college. DC-CAP Last Dollar Awards, a scholarship that funds up to $2,000 per year for five years for students enrolled at eligible two- or four-year colleges, universities, or vocational schools. Students must have graduated from a DC public high school or public charter school and apply through the FAFSA, the DC-CAP Authorization Form, and DCTAG Applications. If you’re a high school student, you should schedule regular guidance appointments to hear about local scholarships and get advice on how to apply. Your counselor can keep you up to date on any new listings or changes that may occur in your area. If you’ve got a busy enough schedule already, try setting an alarm on your phone so that you don’t forget to make an appointment! If you’re still in need of more aid, a private loan may be just what you need to fund the remainder of your college education. To get a better idea of what size of loan you need, and which of our highly vetted loan partners can offer you the best rate, check out our free NitroScore tool. 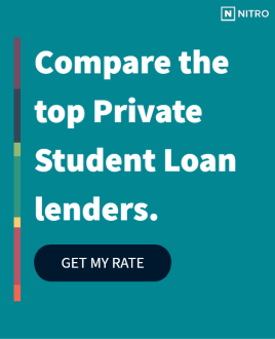 To use this, simply enter a college and major into the tool, and it will calculate your total costs, salary after graduation, and potential loans needed. From there, you will receive a score that tells you how easy those loans will be to repay based on your projected salary. You can customize the results with info about scholarships, grants, and savings — and even compare different college/major combinations. Financial expenses don’t need to stand in the way of you and your college education. DC residents can start planning for their future today!